Happy Friday everyone. It is time for another one of Taylor’s challenges. You do not have to use cupcake images to participate. Check out her site to learn how you could be next weeks featured sampler (and sometimes she even gives away goodies). I usually try not to work with flowers, but when I saw this weeks sketch, I had the perfect images in mind for it. This weeks featured cupcake sampler is Donna Baker. You can see her creation at Serenity in Stamping. Tomorrow, Saturday the 19th, I am selling all the Stampin’ Up! cards* I’ve made and you’ve seen here on my blog. If you are interested in my work, I will be at Tree Of Life Lutheran Church located at 1492 Linglestown Road (Susquehanna Township, Harrisburg Pennsylvania, Near Mountaindale community). I will help in the fundraising efforts for an upcoming Guatemala Mission. Starting at 11am, there will be food, baked goods, a car wash, ……my cards, and all of my retired stamp sets. I love it! Love flowers, the colors you used… the pretty ribbon! TFS! 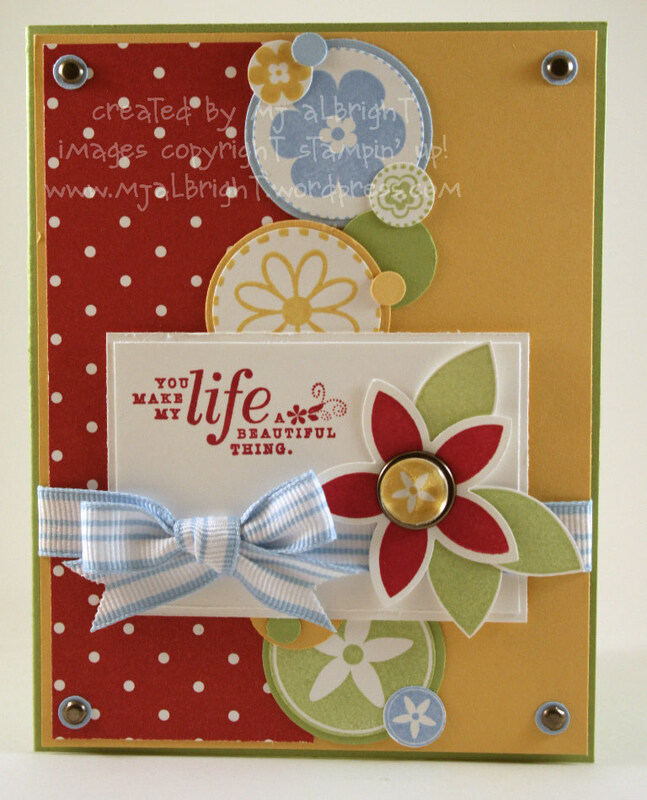 So cute and I love the summery feel to your card MJ! Gorgeous as always! MJ – I love this! I looked at Big and Little Flowers but I didn’t think I could make them work – you sure did – perfectly!! Good luck with the fundraiser tomorrow – what a wonderful way to use your beautiful art! Best wishes at the fund raiser…..your work is awesome so I’m sure you will do them well! Love this card! Super cute. If you have any left over cards, which I’m sure you won’t, I would LOVE to buy some from you. Just FYI. Love the crisp colors and your adorable bow!! Excellent card. Great take on the sketch. Very summery and I love the colours! Oh, how I wish I lived near you! Your cards are beautiful, and I love checking them out on your blog! very pretty, just love these colors! Good luck on the sale of your cards, my daughter is arriving home tomorrow after being on a teen mission trip! you really should think about getting the tabletop cutter by SU! you don’t have to ever replace the blades! It pays for itself in a matter of time because of that! And it’s awesome! Well, I have one I got from on-line for cheaper but it’s made by Tonic-the SAME one. It’s a fabulous card Mary Jo. I adore your flowers in circles and I must say that your bow is surperbly tied. Awesome card all around! Great job. Beautiful card! Love all of the flowers and dimension… it’s really great! Fabulous card, MJ!! Love all your crisp details and layers. This card just makes me smile! TFS. Looooove what you did with that sketch. The cutie pie colors are one of my favorite combos. Love those big flowers and the clean design. So pretty! Stumbled on your blog and loooove your cards! I love your bright cheerful card! I hope your sale went well!